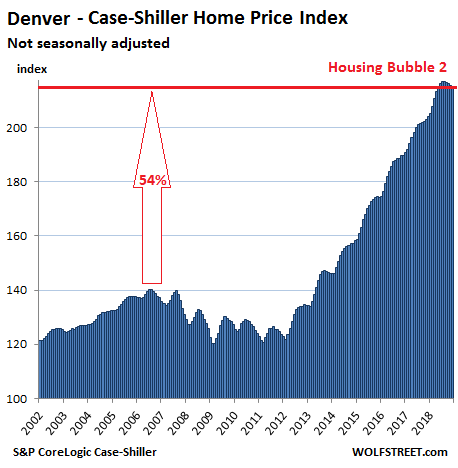 How Low Will Housing Prices Go? 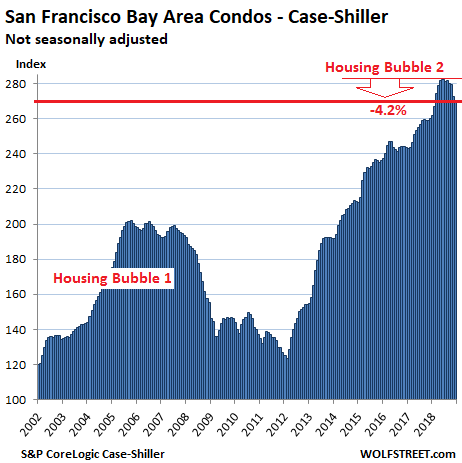 Now that Housing Bubble #2 Is Bursting… How Low Will It Go? Housing Bubble #1 wasn’t allowed to fully retrace the bubble, as the Federal Reserve lowered interest rates to near-zero in 2009 and bought $1+ trillion in sketchy mortgage-backed securities (MBS), essentially turning America’s mortgage market into a branch of the central bank and federal agency guarantors of mortgages (Fannie and Freddie, VA, FHA). The question is: what’s the likely magnitude of the decline? 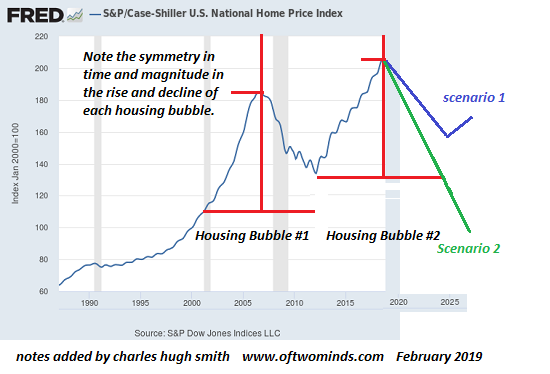 Scenario 1 (blue line) is a symmetrical repeat of Housing Bubble #2: a retrace of the majority of the bubble’s rise but not 100%, which reverses off this somewhat higher base to start Housing Bubble #3. 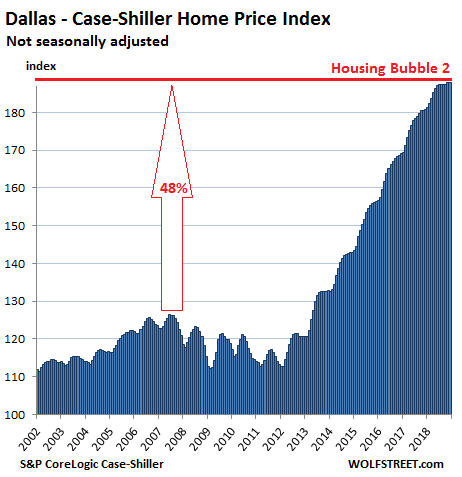 Since the mainstream consensus denies the possibility that Housing Bubble #2 even exists (perish the thought that real estate prices could ever–gasp–drop), they most certainly deny the possibility that prices could retrace much of the gains since 2012. Why is Scenario 2 not just possible but likely? There are no more “saves” in the Fed’s locker. Dropping interest rates to zero and buying another trillion in MBS won’t have the same positive effects they had in 2009-2018. Those policies have run their course. Among independent analysts, Chris Hamilton is a must-read for his integration of demographics and economics. 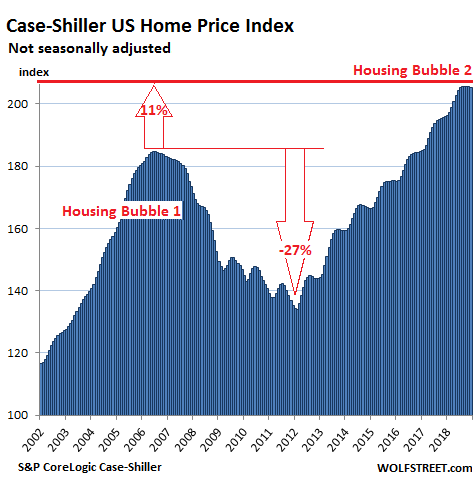 Please read (via Zero Hedge) Demographics, Debt, & Debasement: A Picture Of American Insolvency if you want to understand why near-zero interest rates and buying mortgage-backed securities isn’t going to spark Housing Bubble #3. Millennials are burdened with $1 trillion in student loans and most don’t earn enough to afford a home at today’s nosebleed prices. When the Fed drops the Fed Funds Rate to zero, it doesn’t follow that mortgage rates drop to zero. 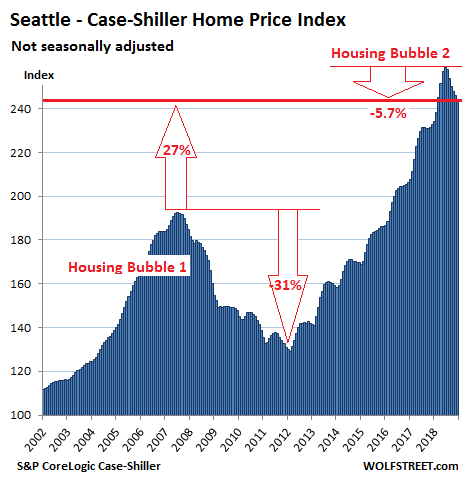 They drop a bit, but not enough to transform an unaffordable house into an affordable one. Buying up $1 trillion in sketchy mortgages worked in 2009 because it bailed out everyone who was at risk of absorbing huge losses as a percentage of those mortgages defaulted. The problem now isn’t one of liquidity or iffy mortgages: it’s the generation that would like to buy homes finds they don’t earn enough, and their incomes are not secure enough, to gamble everything on an overpriced house that chains them to a local economy they might want to leave if opportunities arise elsewhere. In other words, the economy has changed, and the sacrifices required to buy a house in hot markets at today’s prices make no sense. 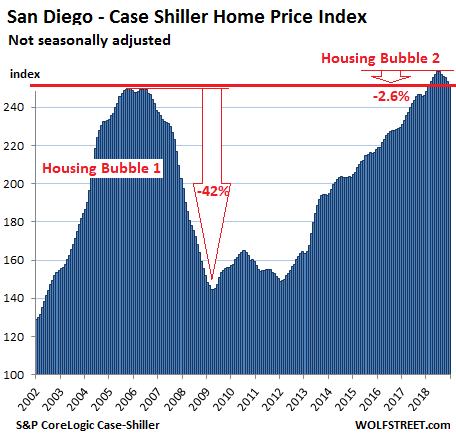 The picture changes, of course, in areas where 2X or 3X a typical income will buy a house, and 1X a pretty good income will buy a house. 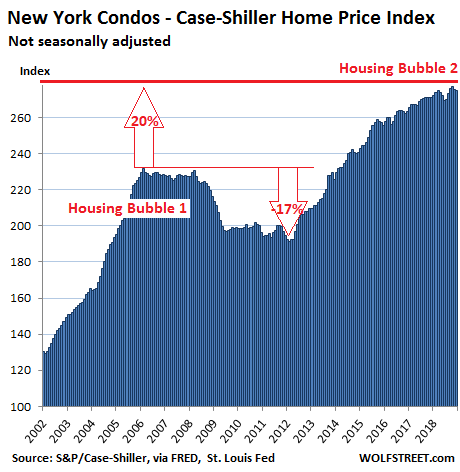 Unless the Fed is going to start buying millions of homes outright, prices are going to fall to what buyers can afford. As China’s debt bubble implodes, the Chinese buyers with cash (probably not even cash, just money borrowed in China’s vast unregulated Shadow Banking System) who have propped up dozens of markets from France to Vancouver will vanish, leaving only the unwealthy as buyers. The only question of any real interest is how low prices will drop by 2025. We’re so accustomed to being surprised on the upside that we’ve forgotten we can surprised on the downside as well. “Student loans make up the majority of the $1,005,000,000,000″, a massive handicap on ability to mortgage a home purchase at today’s prices. 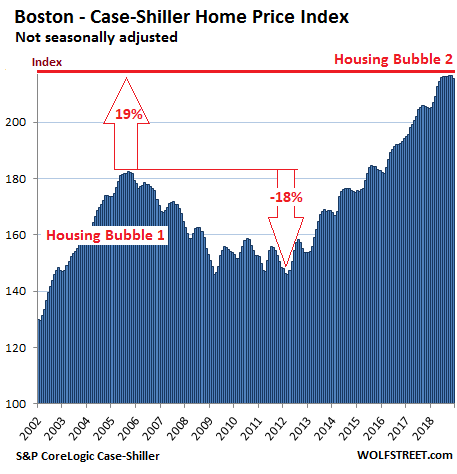 This entry was posted in Housing Market and tagged Home, housing bubble, real estate on February 27, 2019 by Bone Fish. 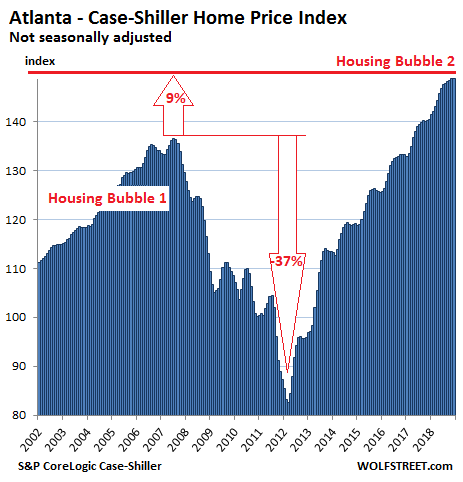 In other words, the housing asset bubble is Already Gone. 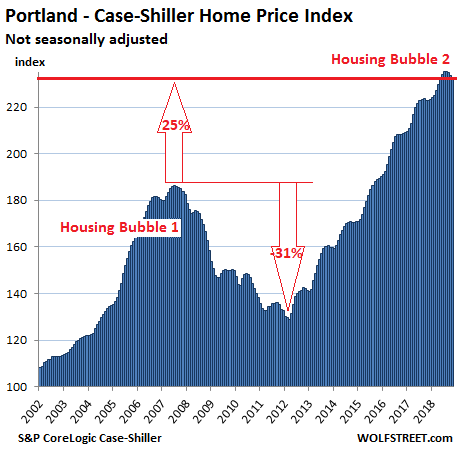 This entry was posted in Housing Market and tagged housing bubble on December 10, 2018 by Bone Fish. Hong Kong homeowners who bought flats in the last several months have seen their value decline as much as 20% in a matter of recent weeks, according to HSBC, sending values into negative equity which had only left the region from the prior downturn that ended in early 2017, reports the South China Morning Post. “Theoretically, buyers who obtained a mortgage of 90 per cent of the flat’s value will fall into negative equity once home prices have dropped more than 10 per cent,” said Chief Vice-President at mReferral Mortgage Brokerage Services, Sharmaine Lau. The largest losses are likely to be flat owners who paid sky-high prices for tiny apartments in older tenements, according to industry watchers, who add that banks tend to become very conservative in valuing such properties when the real estate market takes a turn for the worse. “Lower valuations will first apply to flats that have less marketability. Banks’ valuations, which are supported by surveyors, are made in line with market conditions,” said Cushman and Wakefield head of valuation and advisory services for the Asia-Pacific region, Chiu Kam-kuen. Meanwhile, SCMP was able to find apartments at older housing developments which are now valued at HSBC far below their recent selling prices. A 234 square foot unit at 36-year-old Lee Bo Building in Tuen Mun, which was sold for HK$3.82 million on October 8, is now valued 20 per cent lower at HK$3.08 million. In North Point, a 128 square foot unit at 41-year-old Yalford Building, sold on August 29 for HK$3.1 million, is also valued a fifth lower now by the bank, at HK$2.48 million. In Kowloon, a 210 square foot unit at 34-year-old Hong Fai Building in Cheung Sha Wan sold for HK$3.87 million on June 20 is already down about 13 per cent, according to HSBC, at HK$3.38 million. The spectre of negative equity is only going to get worse, according to Louis Chan, Asia-Pacific vice-chairman and chief executive for residential sales at Centaline Property. The precipitous drop may force companies such as the Hong Kong Mortgage Corporation (HKMC) to adjust their mortgage insurance program in light of market developments. Under the program, buyers of flats worth less than HK$4.5 million can get mortgage loans of up to 90 per cent of the unit’s value, capped at HK$3.6 million, while for flats priced between HK$4.5 million and HK$6 million the maximum loan-to-value ratio is 80 per cent, capped at HK$4.8 million. 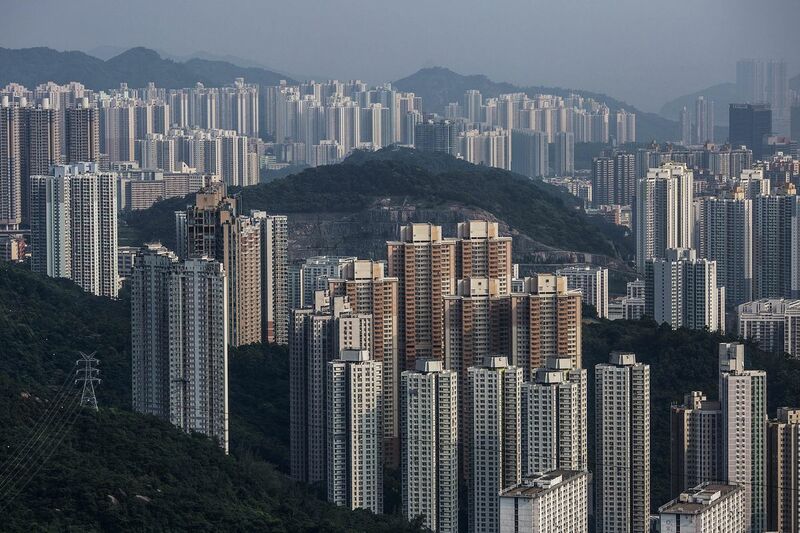 Negative equity reached its peak in Hong Kong in 2003 following an outbreak of Severe Acute Respiratory Syndrome (SARS) which sent already-teetering home values plummeting. According to the HKMA, over 105,000 households found themselves in negative equity at the time – all of which were above water as of the first quarter of last year. 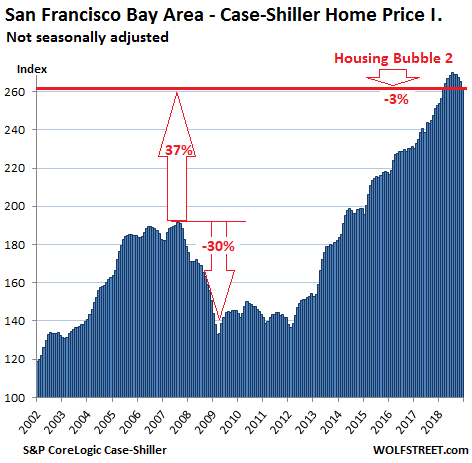 This entry was posted in Housing Market and tagged Hong Kong, Hong Kong Real Estate, housing bubble on October 30, 2018 by Bone Fish. Fannie Mae and Freddie Mac, the mortgage giants in seemingly perpertual conversatorship with the FHFA, have mortgage loans that are even more risky in terms of loan-to-value (LTV) ratios than during the catastrophic housing bubble of the 2000s. The “good” news is that the average FICO (credit) score for Fannie and Freddie loan purchases is above those from the housing bubble. But the trend is worrisome. In terms of Debt-to-income ratios (or Detes as Tom Haverford would say), the Detes are below housing bubble levels, but have been rising since the end of 2008. 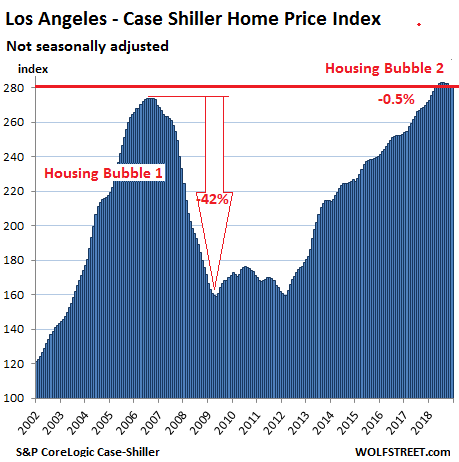 This entry was posted in Housing Market and tagged housing bubble on October 4, 2018 by Bone Fish.